Omaha, Nebraska, April 28, 2016. Photo courtesy of Tonya Ford. In April 2015, a rail car explosion in Omaha took the lives of two Nebraska Railcar Cleaning Services employees: 40-year-old Dallas Foulk and 44-year-old Adrian LaPour. 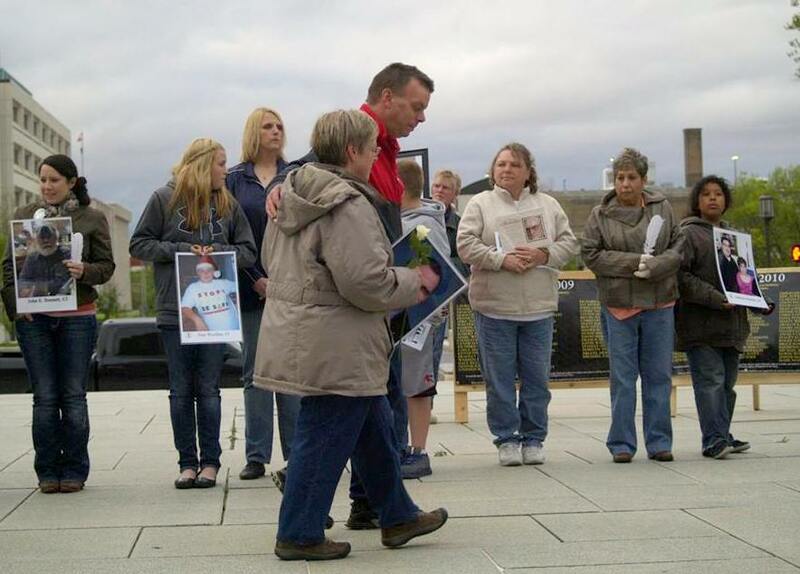 On April 28, in an event organized by United Support and Memorial for Workplace Fatalities, friends, family members, and safety advocates came together to remember over 50 workers who died on the job in Nebraska last year, and to call for workplace protections that will save lives. The event was just one of over a hundred held around the country for Workers’ Memorial Week (WMW), April 23-30. Marking the anniversary of the signing of the Occupational Safety and Health Act in 1970, WMW is a time of action for workers’ centers, unions, community groups, health and safety advocates, and the families of victims, campaigning together for safer workplaces. National COSH provides support and resources for local WMW activities. We’ve compiled an extensive list of events in the U.S., and our friends at Hazards Magazine and the International Trade Union Confederation (ITUC) have a listing of WMW actions around the world at 28april.org. The final toll of U.S. workers killed in 2015 is not yet available, but on April 21, the U.S. Bureau of Labor Statistics (BLS) released their final figures for 2014, reporting that 4,821 perished from work injuries. On April 27, National COSH released our PREVENTABLE DEATHS 2016 report – the first analysis of the trends represented in the revised BLS numbers. Recent research on deaths from long-term occupational diseases, indicating that over 95,000 U.S. workers die every year due to exposure to hazardous materials or conditions on the job. Awards for Outstanding Health and Safety Stories, recognizing in-depth investigations of critical health and safety issues. Shareable infographics highlighting occupational health and safety trends. Allies and local COSH groups also issued reports for Workers’ Memorial Week. AFL-CIO: Death on the Job: The Toll of Neglect. The 2016 edition marks the 25th year the AFL-CIO has produced a report on the state of safety and health protections for America’s workers. Contains a twenty-five year overview of U.S. safety and health and state-by-state comparisons. 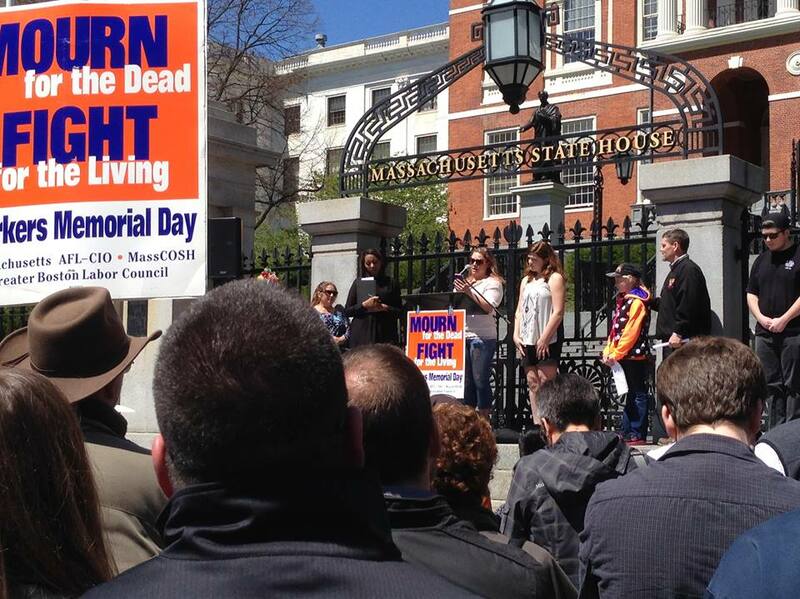 MassCOSH and Massachusetts AFL-CIO: Dying for Work in Massachusetts. 63 workers lost their lives in Massachusetts in 2015. This report includes an "In Memoriam" tribute, as well as chapters on workplace violence; climate change; transportation deaths; "workplace wellness" programs; unequal job protections for municipal workers; and the role and effectiveness of OSHA. 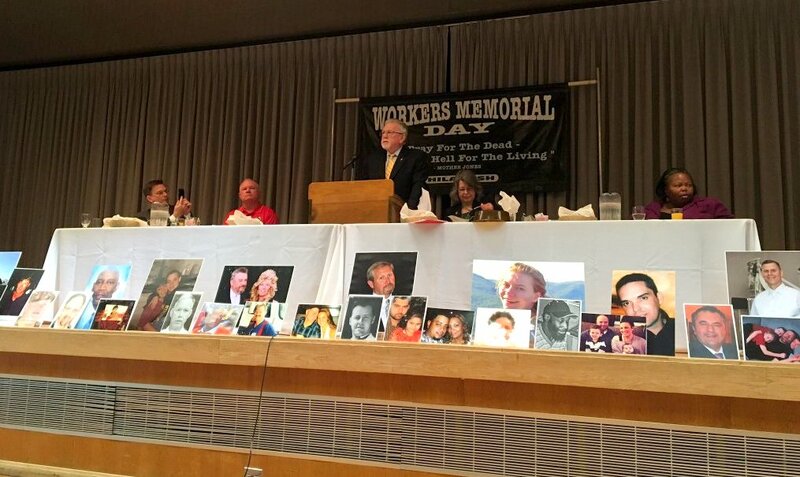 South Florida COSH: Workers' Memorial Day Report for Florida. The report found that workplace fatalities in Florida have dropped slightly from 239 deaths in 2013 to 228 in 2014. Construction, administrative and waste services, and transportation and warehousing remain the three industries with the highest number of workplace fatalities in Florida. Houston COSH (Fe y Justicia): Worker Memorial Day Report 2016: Workplace Fatalities in the Houston Area. This report includes an analysis of worker deaths in the Houston area; overall worker fatality trends in Texas; a report on OSHA activities in Houston and in Texas; a section on heat hazards; and an "In Memoriam" section with remembrances of local workers who lost their lives on the job. This report is also available in Spanish. Workers Defense Project and Public Citizen: The Price of Inaction: The Cost of Construction Injuries in the Lone Star State. Every day, at least 15 workers become ill or are seriously injured on Texas construction sites. Even worse, a construction worker is killed in the state every three days. The report’s authors estimate the costs of injuries, illnesses, and fatalities in the Texas construction industry, and describe the shifting of those costs from construction businesses to injured workers, their families, and taxpayers. Knox Area Workers' Memorial Day Committee: Tennessee Workers: Dying for a Job. The report on worker fatalities in Tennessee for 2014 and 2015 includes an in memoriam section; positive developments for workers in Tennessee; areas of concern; and recommendations for federal, state, and local governments, as well as public and private employers. Local COSH groups also organized Workers’ Memorial Week events across the country. Here are just a few of the inspiring memorials and actions. See COSH Network in the News for media coverage. 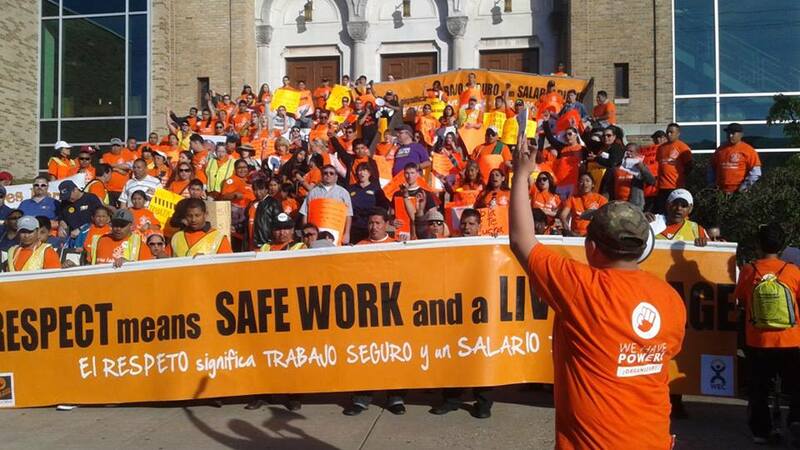 NJWEC, New Labor and allies kicked off the week with a march and rally in New Brunswick, New Jersey. Photo courtesy of New Labor. In Philadelphia, PhilaPOSH and union leaders spoke about recent Philadelphia-area fatalities. They were joined by OSHA chief Dr. David Michaels. Photo courtesy of Philadelphia AFL-CIO. 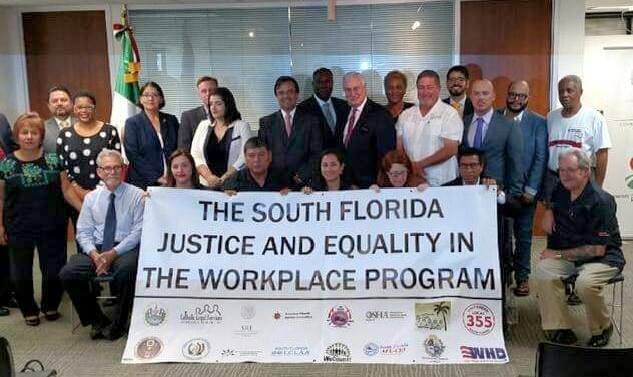 In Miami, South Florida COSH (a program of South Florida Interfaith Worker Justice), joined with allies to launch the Justice and Equality in the Workplace Program, a collaborative effort among U.S. government agencies, consulates of foreign governments, and U.S. community organizations to create safer workplaces for vulnerable workers in South Florida. Photo courtesy of South Florida AFL-CIO. COSH groups across the country organized screenings of the film “A Day’s Work” for Workers’ Memorial Week. 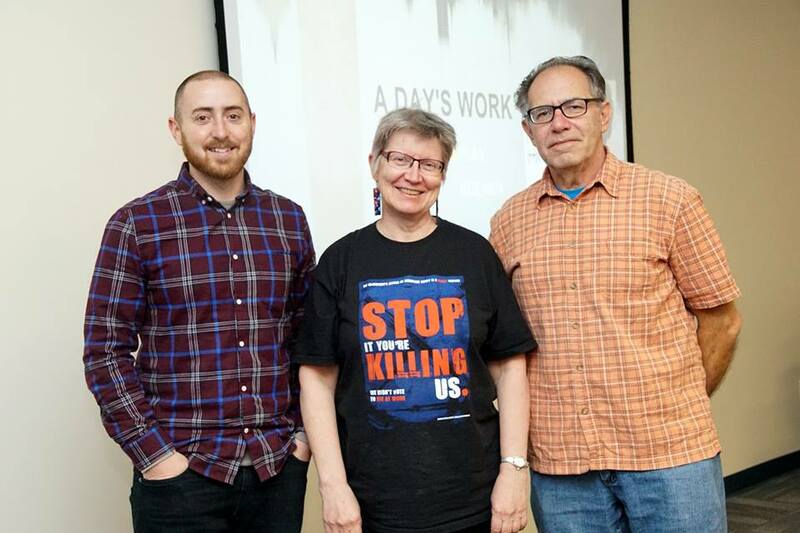 Film producer Dave DeSario, Dorothy Wigmore of Occupational Health Clinical Center, and George Gonos of Florida International University’s Center for Labor Research and Studies spoke at this event in Syracuse. Photo courtesy of the Central New York Labor Federation. 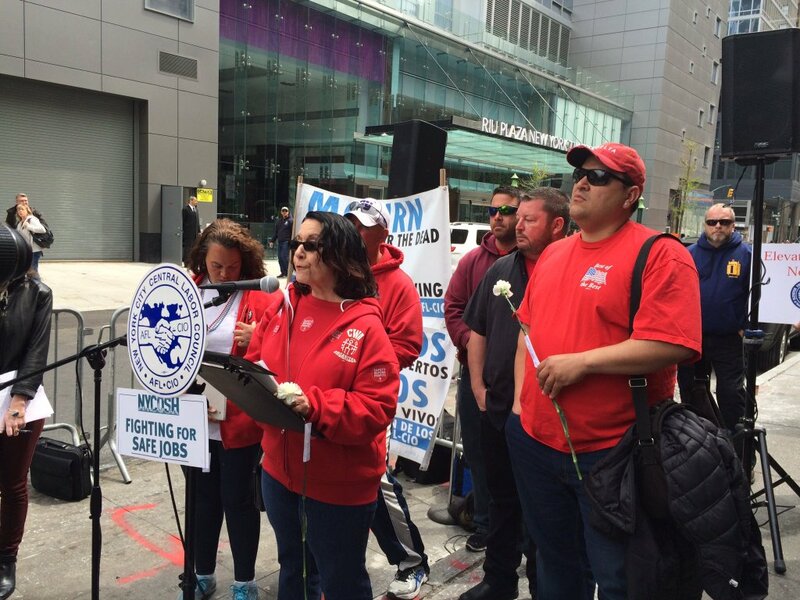 At an NYCOSH rally in New York City, Micki Siegal de Hernandez of the Communications Workers of America told the crowd that striking Verizon workers want fair and safe jobs. Photo courtesy of NYCOSH. MassCOSH rallied at the State House in Boston. Photo courtesy of Massachusetts Interfaith Committee for Worker Justice. 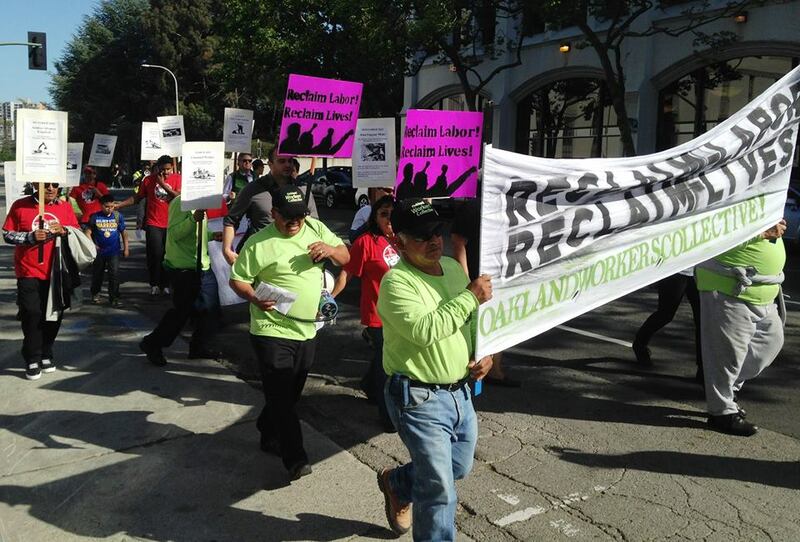 Worksafe and its allies on the march in Oakland, California. Photo courtesy of Worksafe. 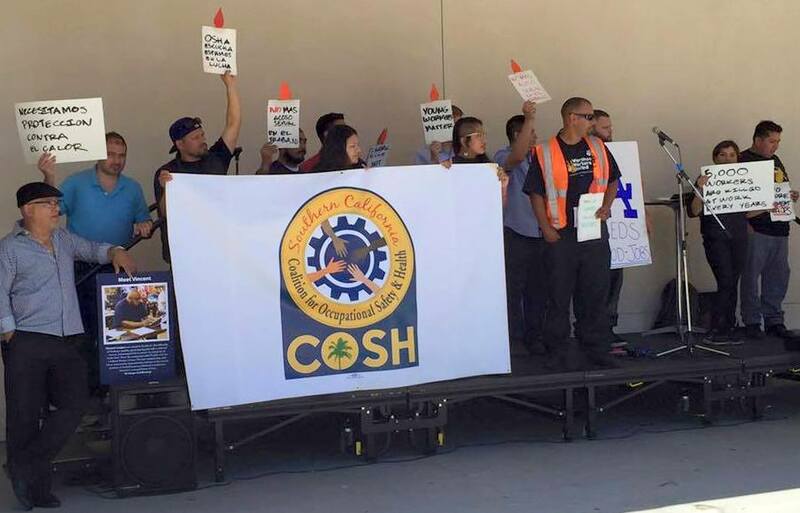 SoCalCOSH rallied in Los Angeles. Photo courtesy of Union Review.